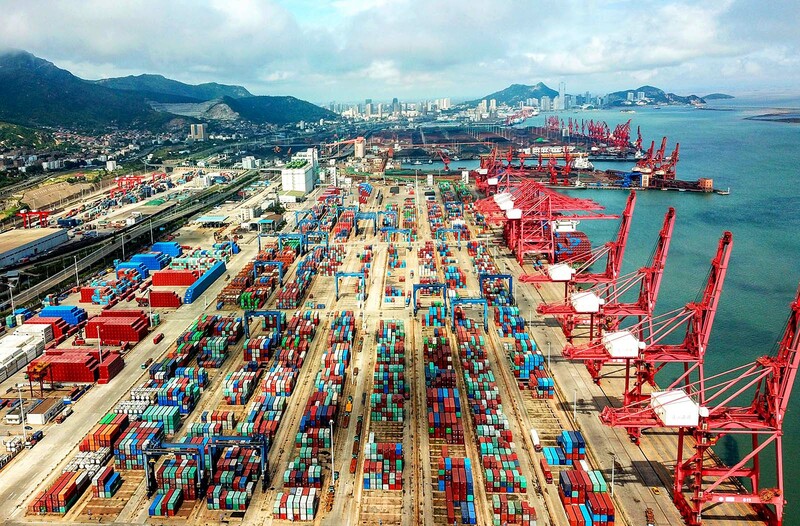 Containers are seen at a port in Lianyungang in China's eastern Jiangsu province. A narrative is building that countries in Southeast Asia will be able to benefit from an all-out trade war between the U.S. and China. U.S. trade protectionism has escalated through 2018—with an increasing focus on China. The U.S. so far has imposed tariffs on $250 billion of imports from China, to which China has responded with tariffs of its own on $110 billion of U.S. imports. The meeting between President Donald Trump and President Xi Jinping in early December has led to a truce, but there is a high risk that frictions will rumble on after the 90-day tariff freeze ends, if not before. 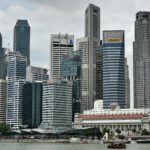 A trade war between the two economies is a lose-lose proposition for the world economy and especially for Asia, which is home to some of the most open economies in the world. We quantitatively test these anecdotes by analyzing 7,705 products on the U.S. and China tariff lists. Two channels of potential benefit from this trade war are identified: import substitution (in the short term) and production relocation (in the medium term). How some countries—and more pertinently, companies and certain industries within countries—can benefit from the trade conflict is largely due to these two channels. In the short term, if the U.S. and China charge higher tariffs on each other’s imports, then companies in the two countries will have an incentive to replace these now expensive imports with local production sources or substitute from other countries. 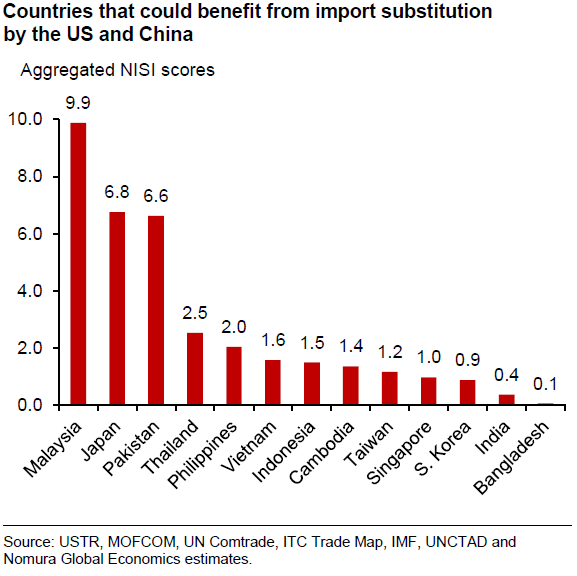 It is likely that Malaysia will emerge as the biggest beneficiary of import substitution by companies in China and the U.S., followed by Japan, Pakistan, Thailand and the Philippines. Of the 13 countries, Bangladesh, India and South Korea stand out as the least likely to gain on a relative basis in terms of import substitution. Our analysis shows that the biggest benefit to Malaysia is likely to come from electronic integrated circuits, liquefied natural gas and communication apparatus. For others, there is usually one leading product: “Vehicles with only spark-ignition internal combustion reciprocating piston engines” in Japan, cotton yarn in Pakistan, “units of automatic data processing” in Thailand and “electronic integrated circuits” in the Philippines. 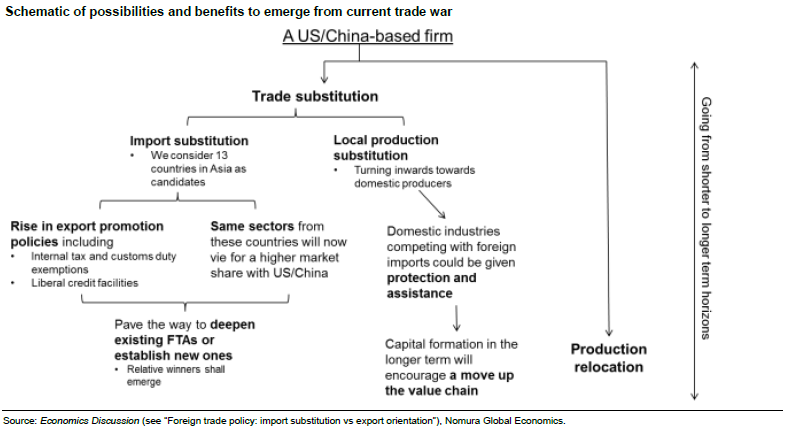 Meanwhile, a prolonged U.S.-China trade conflict, in the medium term, would encourage multinationals to start diverting some of their production to factories in other countries to escape tariffs or even relocate entire manufacturing processes if the trade war continues. From a diversion of production and FDI perspective, our findings show that in the medium term, Vietnam is the Asian country that will benefit the most, followed by Malaysia, Singapore, India and Thailand. 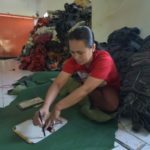 Globalization has led to an explosion of multinationals operating around the word, resulting in increasingly fragmented global supply chains. China sits at the center of this global goods trade network. Indeed, it makes little sense to refer to “Chinese exports” given that last year, 43 percent of China’s exports were produced by foreign-invested enterprises in China. 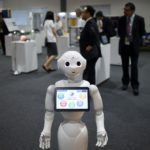 Economists tend to consider FDI to be slow-moving and sticky, but multinationals, often aided by new technologies, are much more nimble than they are sometimes given credit for. For example, in January 2018, when the U.S. imposed anti-dumping duties on washing machines manufactured in China, this did result in a decline in China’s exports of washing machines to the U.S.—but its washing machine exports to other countries remained strong. At the same time, South Korean multinationals were prompted to shift their washing machine production from China to Vietnam and Thailand, allowing them to grow their market share in the U.S.
Irrespective of any positive substitution effects, Asian countries are large suppliers of parts and components to China that are then assembled into exports, for which the U.S. is a major final destination. Asian economies indirectly face large negative impacts from higher U.S. import tariffs on China. Largely because of Asia’s elaborate supply chain—which so often ends at China—Asia, as a region, is likely to be a loser in a full U.S.-China trade war scenario. 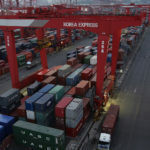 Once scaled by GDP of the country of origin, eight of the 10 largest contributors of value-addition to China’s gross exports are Asian, namely Taiwan at 6.3 percent of its GDP, followed by Malaysia (4.1 percent), South Korea and Hong Kong (3.2 percent), Singapore (3.1 percent), Vietnam (2.8 percent), Thailand (2.5 percent) and the Philippines (2.3 percent). 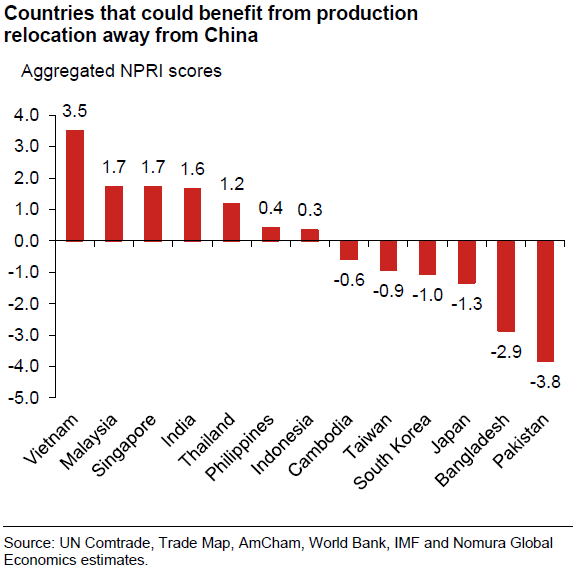 Asia is also a large exporter of capital goods and could therefore be heavily affected if rising protectionism causes more companies globally to delay their investment plans. If China responds by depreciating the RMB, other Asian countries that have export structures similar to China’s could face greater competition, while China’s own purchasing power to buy imports from the rest of the region would be dented. 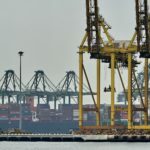 On the other hand, in the longer run, winners in Asia may emerge at a more macro level if the U.S. continues to turn inward and China fills the void by taking a greater leadership role in currently negotiated regional free trade agreements and revamping the Belt and Road Initiative, its multitrillion dollar overseas infrastructure initiative. 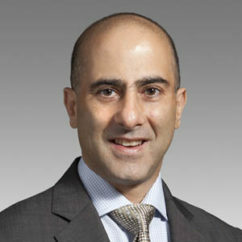 Robert Subbaraman manages a team of around 20 economists and strategists, who forecast Asia’s economies and make market trade recommendations. Mr. Subbaraman chairs the Asia ex-Japan research executive committee, and is on Nomura’s executive committees for Global Markets Research and Global Emerging Markets. 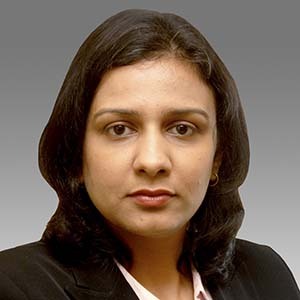 Sonal Varma is Nomura’s chief India economist based in Singapore. She joined Nomura in October 2008 from Lehman Brothers, where she served as India economist. She previously worked as an economist at ICICI Bank and rating agency CRISIL, and was a member of the Indian government’s working group to construct the index of industrial production. The Future of Belt and Road: Debt and Delays, or Huge Growth?